The perfect cookie to celebrate that special day. 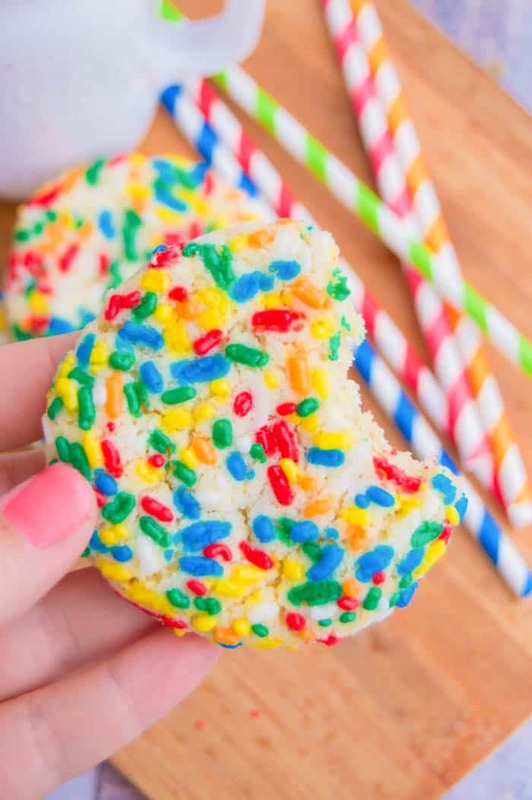 These Birthday Sprinkle Cookies are full of bright colors and great taste. 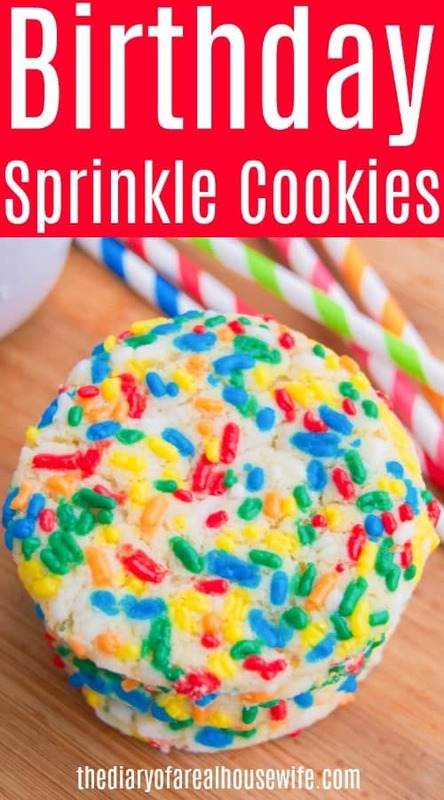 Sprinkle cookies are the BEST! I love that you can change up the color of the sprinkles to go with any holiday or match any theme. 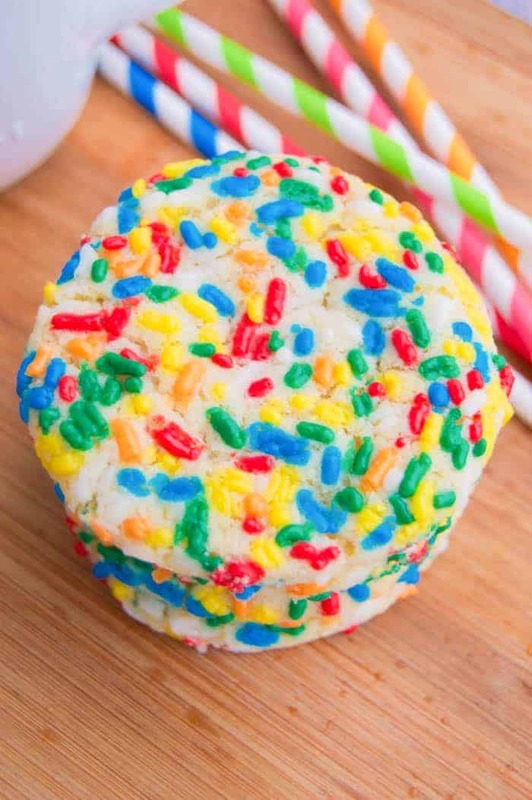 Today I wanted to share my super colorful birthday sprinkle cookies. They are so good and the perfect treat for your special day. If you love cookies as much as I do then make sure to check out the rest of my favorite cookie recipes next. Mix in your egg and vanilla extract. In a separate bowl whisk together baking soda, baking powder, and flour. Place sprinkles on a plate. Scoop out 1 1/2 tbsp of dough and place in the sprinkles. Roll the dough until completely covered in sprinkles. Place sprinkle covered cookie onto your prepared baking sheet and press down. Remove from oven then allow to cool on the baking sheet for 8-10 minutes. Chocolate Chip Cheesecake Dip: I love cheesecake! On my birthday I actually prefer it over a tradition birthday cake. This recipe is so simple and one I think you will love as much as I do. No Bake Hersey Pie: This was my moms favorite dessert recipe! She made it for any special occasion and my entire family loves it. Cookie Dough Fudge: This fudge is one of my favorites. The perfect sweet treat, you can”t eat just one. The birthday cookie for a special celebration. Preheat oven to 350 degrees F. Prepare a baking sheet with non-stick cooking spray or parchment paper and set aside. In a stand mixer or using a hand mixer cream together butter and sugar until light and fluffy. Mix in your egg and vanilla extract. In a separate bowl whisk together baking soda, baking powder, and flour. Slowly mix this in with your wet ingredients. Mixing until well combined. Place sprinkles on a plate. Scoop out 1 1/2 tbsp of dough and place in the sprinkles. Roll the dough until completely covered in sprinkles. Place sprinkle covered cookie onto your prepared baking sheet and press down. Bake for 10 minutes. Remove from oven then allow to cool on the baking sheet for 8-10 minutes.